The monthly publication of the Reichsfilmkammer, Der Deutsche Film, is especially rare. Annual circulation was only 6500 copies (Walter,Harald, Die Werbung fuer den deutschen Film, Dresden, 1941, pg.123) and mostly confined to the film industry and film trade as well as overseas agencies. From 1936 to mid-1943, 81 individual issues and one "Sonderausgabe 1940/41" large format issue of this magazine were published. The magazine was banned by the Allies as a forbidden publication at the end of WWII (http://vho.org/censor) and all known copies pulled from libraries along with other propaganda and official National Socialist material and burned. The Reichsfilmkammer offices ( seen on the left )were located on Bendlerstrasse 33 in pre–1945 Berlin. They were next door to the building housing the League of German Cinema Owners and in the heart of Berlin near Potsdamer Platz. The public notice at right from July 1945, informs Berliners that they must bring all Nazi flags, banners, books, magazines (Zeitschriften), LP records, sheet music, all stock/inventory of Nazi businesses, and all items of the Hitler Youth and Party affiliated organisations to a collection point, and that shirkers will be severely prosecuted. All the books and magazines –– such as Der Deutsche Film –– were burned in massive book burnings all across Germany. The Gillespie Collection has, over many years of searching, managed to accumulate a full set of all 82 issues. 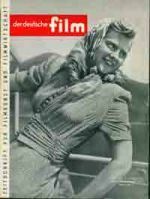 In late 2007 two over-sized double-issues (Grossformat) from August and October 1941, published in conjunction with that year's Venice Film Festival, were scanned and sent gratis to the Berlin Film Archive of the Bundesarchiv, to fill the long-standing gap in their collection. Subsequently, scholars from the UK; America, Germany and Belgium have requested scans of particular issues. This is but one example of the dedication to research and exchange of materials made by the Gillespie Collection. The banned 1943 Peter Pewas film Der verzauberte Tag takes place around a village train station. Here is a still from the film with the female protagonists seen as news kiosk ladies. 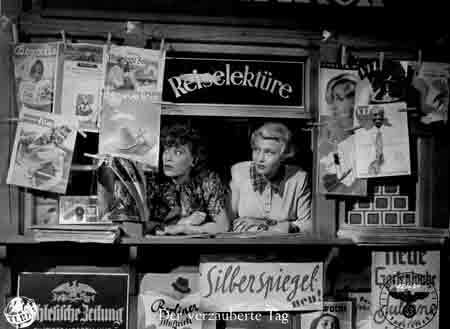 Note the DER DEUTSCHE FILM magazine issue shown in colour above left (from October 1942) shown in the film lobby card as well, on display hanging on the left side of the kiosk.....a contemporary magazine in a contemporary film in the Third Reich.